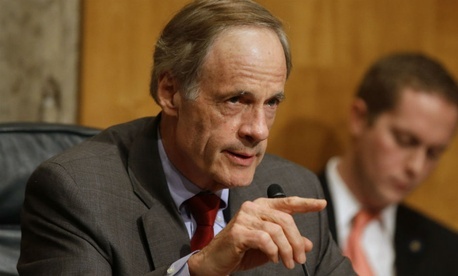 Sen. Tom Carper, D-Del., chairman of the Senate Homeland Security and Governmental Affairs Committee and co-author of a committee-passed bill to restructure the cash-strapped USPS, tried to strong-arm members of his own party into adopting the plan, according to Democratic aides. Many Democrats have longstanding issues with the bill, including workforce concerns, a provision to make emergency rate increases permanent and a measure to roll back gun restrictions in postal areas -- caused Carper’s last-ditch efforts to fall short. When the effort to tie postal reform to the spending bill failed, Carper attempted to pass it late last week using a procedural move called unanimous consent, which allows legislation to move quickly so long as no senator objects. However, Sen. Tammy Baldwin, D-Wis., scuttled that strategy by refusing to give her consent. A longtime advocate of postal reform both in this Congress and previous sessions, Carper, along with the committee’s Ranking Member Tom Coburn, R-Okla., the bill’s co-sponsor, renewed his efforts to pass a significant postal bill in the lame duck session. Carper held a meeting last week with HSGAC Democrats and Sen. Bernie Sanders, I-Vt., who has his own postal overhaul bill, to rally support for the 11th hour undertaking. At that meeting, an aide told Government Executive, Carper showed no interest in compromise, instead telling members it was his bill or nothing. Carper attempted to strengthen his position by threatening to allow the Postal Service to follow through on its plan to shutter 82 processing plants next year, which will lead to loss of at least 7,000 jobs and the relocation of even more. “I was shocked at how much he does not listen to members when they are expressing their concerns,” the aide said. Fifty-one senators and 160 House representatives previously signed a letter to prevent USPS from moving forward with the consolidations through the appropriations process, but the final CRomnibus does not include such a prohibition. Instead, the report on the bill “encouraged” the Postal Service to delay the closures. When the lawmakers at last week’s meeting told Carper it was too late to move forward with such a sweeping bill and said they should instead focus on preventing the facility closures, an aide said Carper rejected the proposal. In fact, Carper said those who opposed him would bear the blame for the consolidations. “To hear them try to push this bill at last minute, it was very disappointing to the Democratic caucus,” the aide said. Democrats were incensed when Carper joined Coburn in writing a letter to congressional appropriators telling them to ignore the original letter and allow USPS to move forward with its consolidation plan. The aide said the Carper-Coburn letter contained “very Republican” language. The process of crafting the bill was “very insular between Carper and Coburn,” the aide said, adding that the oversight chairman failed to substantively include the thoughts of unions, mailers and other stakeholders. A Carper aide took issue with that assessment, saying the senator “closely worked with colleagues, postal leadership and stakeholders to find a path forward” for his bill. The aide noted the Carper-Coburn bill included a provision to delay the scheduled plant closures for several years. Carper and Coburn worked closely with postal management in crafting the bill. While Carper won the endorsement of the agency and enough members of both parties to move the legislation through his panel, he was unable to appease all concerns. One notable dissenter was Sen. Jon Tester, D-Mont., who voted against the bill in committee and recently took to the Senate floor to renew his opposition. A spokesman said Tester opposed Carper’s push due to a provision to overhaul workers’ compensation for all federal employees, the aforementioned rate hike and the movement away from to-the-door delivery in favor of cluster boxes. He said the senator would continue to work for a “balanced” postal reform bill in the future. Carper pressed on, using the government spending bill, as it was “the only moving vehicle” he and his allies saw. Even if Democrats had held their noses and allowed the bill to be attached, the aide said there was very little coordination with the House. It would not be without precedent to attach a major policy to the spending bill at the last minute; House and Senate leaders agreed to do just that with a reform of struggling employers’ pension obligations. However, without a similar agreement for postal language, Carper’s maneuver was likely doomed from the start. The House Oversight and Government Reform Committee, led by Rep. Darrell Issa, R-Calif., has approved two separate postal reform bills, but dissent from lawmakers in both parties has prevented either from receiving a vote on the House floor. With the Senate likely to adjourn this week without any action on postal legislation, the fate of reform will fall to new leadership. Carper will move to a ranking member position as Sen. Ron Johnson, R-Wis., will take the reins as HSGAC chairman, and Rep. Jason Chaffetz, R-Utah, will head the House oversight committee. This story has been updated with additional comments from Carper's office. CORRECTION: This story originally said Sen. Rob Portman, R-Ohio, would replace Carper as HSGAC chairman. It has been corrected to note that Johnson will serve as the committee's chairman in the 114th Congress.